If Chennai city has the distinguished sabha tradition of holding dance and music soirees throughout the holy month of Margazhi each year, the metropolis of Kolkata has grown and sustained a six-decade-old tradition of annual whole-night music concerts, terminating with the glorious Republic Day sunrise. What began in 1952 with sundry music lovers getting together to enjoy January evening's touch of cold with crystal clear classical melodies, soon gathered momentum with Narendra Singh Singhi's offer of his palatial residence precincts at Singhi Park on Dover Lane as the earmarked venue. Before long, the enthusiastic listeners made it four consecutive whole night functions every January with overwhelming demand for tickets, laced the ragas with classical dance cadenza as per audience request and shifted the location to the more commodious Nazrul Mancha. The rest, as they say, is history. A Festival of Indian Classical Dance presented by the Dover Lane Music Conference and the Dover Lane Music Academy - both still functioning from the haloed original precincts - is now a separate and more manageable 3-day offering of four dance styles daily, barring three forms on the last evening in order to close with a celebrity dancer, allotted unlimited time. 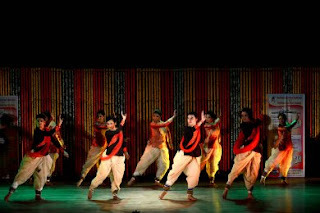 While last year the final dancer was the youthful Kathak prodigy Vishal Krishna from Banaras, this year it was Sujata Mohapatra, whose dance style was honed over 18 long years by the legendary guru Kelucharan Mohapatra after Orissa's temple friezes of engraved danseuses.